This is a great family recipe, and fairly easy to assemble. It also goes a long way. 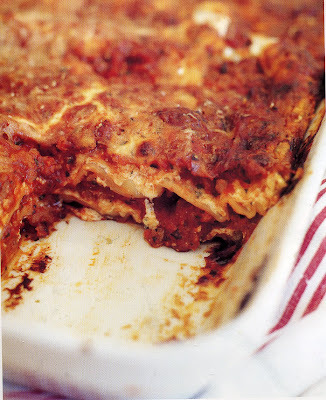 In honor of the new First Family I present to you Ina Garten's version of lasagna. Ta-da. Heat the olive oil in a large (10-to 12-inch) skillet. Add the onion and cook for five minutes over medium-low heat, until translucent. Add the garlic and cook for 1 more minute. Add the sausage and cook over medium-low heat, breaking it up with the fork, for 8 to 10 minutes, or until no longer pink. Add the tomatoes, tomato paste, 2 tablespoons of the parsley, the basil, 1 1/2 teaspoons salt, and 1/2 teaspoon of pepper. Simmer, uncovered, over medium-low heat, for about 15 to 20 minutes, until thickened. In a medium bowl, combine the ricotta, goat cheese, 1 cup of Parmesan, the egg, the remaining three tablespoons of parsley, 1/2 teaspoon salt, and 1/4 teaspoon pepper. Set aside. Ladle 1/3 of the sauce into a 9 x 12 x 2-inch rectangular baking dish, spreading the sauce over the bottom of the dish. Then add the layers as follows: half the pasta, half the mozzarella, half the ricotta, and one third of the sauce. Sprinkle with 1/4 cup of Parmesan cheese. Bake for 30 minutes, until the sauce is bubbling. This sounds delicious and I want to try it! I may have to make substitutions though. Does sea urchin work okay in place of turkey sausage?